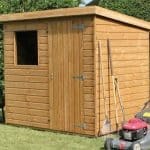 The superb quality Redwood Shiplap tongue and groove pent shed is a fine example of the Treetops Traditional collection. From the inside out, a lot of attention to detail has been given to the sheds design and it comes with great customisation options. 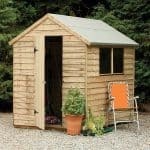 Compared to its competitors, this little shed really stands alone in terms of exceptional quality and superior features. There are several variations of the Traditional Standard shed and this one comes with a pent roof. This makes it a perfect option for gardens with height restrictions. The pent roof offers just the same waterproof and rot resistant benefits as an apex roof, but it can be installed underneath low hanging objects. The single door can be positioned in three different ways and it features three strong hinges. This model also comes with 3 fixed windows, though these can also be customised and you can even get rid of them completely and opt for a windowless design instead. The fact you can make so many customisations is fantastic. We also love the security added to the building. 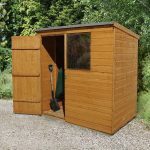 Compared to a lot of sheds in the same price range, this one is extremely impressive and it is one of our most highly rated compact storage sheds. The roofing felt isn’t designed to withstand harsh weather. Therefore we do recommend buying a better quality felt elsewhere. The Traditional Standard Pent Shed is one of many models in the high quality Treetops Traditional range. Offering a compact yet generous amount of storage space, this model comes with some pretty great features. Although the pent roof does make it suitable for installing in height restricted areas, the shed still comes with a comfortable interior head height. The front of the shed is taller than the back and it offers an extra wide single door. If your garden has low hanging trees or you need to install the shed in front of another building, the pent roof on this model is extremely beneficial. It acts as a great rainwater filter and this shed benefits from a slight roof overhang at the front. This is actually pretty unique for a pent shed and it protects the cladding at the front of the building. As you can see in the picture, the roof also has quite a thick design. This is down to the tongue and groove construction; giving it an incredibly durable and high quality design. The floor is also made with 12mm tongue and groove which makes it excellent for heavy storage. 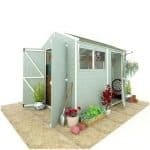 The thorough tongue and groove design does push up the cost of the shed a little but the extra cost is definitely worth paying for due to the amount of durability, security and stability provided. The manufacturer has built this shed from premium grade Redwood Shiplap tongue and groove materials. This really thick cladding makes the walls ultra weatherproof and resistant to daily wear and tear. The panels of the shed have a ‘tongue’ and ‘groove’ at either end which makes them simply click into place. Together they form an interlocking profile which helps to keep out drafts as well as rain. The Shiplap element of the design also provides a water draining channel. Situated between the panels, a small indented groove runs horizontally across, helping to prevent rot as rainwater is quickly drained away from the building. A 44mm x 27mm frame secures the cladding, ensuring maximum stability. A high quality dip treatment has been used on the timber at the factory. This doesn’t just protect it during transit, but it also provides excellent weather resistance for up to 6 weeks after installation. It is advisable to use a good quality treatment within 6 weeks and then annually for the rest of the shed’s life. As standard this shed comes complete with a single door and three fixed windows (though the picture provided only shows one window). What’s interesting with this shed is the fact you can alter the position of both the door and the windows. You also have additional customisation options for the windows too. With the door, it can be moved to the centre, or offset to either side at the front of the building. It is worth being aware that if you do alter the position of the door, it may limit the amount of space available for the windows. You can contact the manufacturer to move the windows onto the side of the building. The windows are built from horticultural glass. They come fixed, but Shed Store allow you to upgrade to opening windows. It will cost you extra for each window you choose to upgrade. If you’d prefer, you can also change to a windowless design which won’t cost anything extra. Both the security and the privacy on this shed are fantastic. The key operated lock is a unique addition featured on the Treetops Traditional range. It is a much more secure locking system than a padlock. Though initially the shed doesn’t come with much privacy, you can alter this and choose the windowless option This will also enhance security. However, if you’d rather keep the three windows but you still want some privacy, you can cover one, or all of the windows with curtains. There’s one thing the Treetops Traditional range is famous for and that’s its superb customisation options. You are free to customise the door and windows. With the door you can choose from three different positions. It can be placed on the front left, right or in the centre. All of these placement options are free so you won’t need to pay anything extra. It gives you complete control over not only what the shed looks like, but how it functions. With the windows you can change them from fixed to openable. It will cost a little more to upgrade each window and we’d largely recommend upgrading if you’re using the shed to work in. Opening windows will help to ventilate the building which is especially beneficial in hot summer weather. There’s also an option to eliminate the windows from the sheds design entirely. A windowless shed is better suited for those who plan on storing anything valuable. As well as customising the doors and windows, you can upgrade the floor by adding bearers. Designed to protect the floor of the shed from rot, these bearers are inexpensive and help to not only lengthen its lifespan, but also to provide extra stability. The last extra you might really benefit from is the Garden Building Installation Service. It really depends upon which customisation options you opt for as to how useful this service will be. It is a costly service but it will save you a lot of stress and you will be able to just enjoy using the shed rather than worrying about which bits go where. Saying that, it isn’t difficult to assemble compared to a lot of other wooden outdoor buildings. 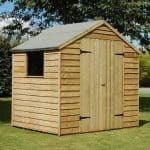 The Treetops Traditional range is by far one of the highest quality shed collections we’ve come across. There isn’t anything to fault on this building and it boasts an impeccable design. Both inside and out, the materials of the building are really designed to last. If you didn’t have to apply annual treatments to maintain its longevity then we could have given it full 10/10 marks. Though this is one of the smaller sheds available, it does provide a good level of interior space. It is suitable for general garden storage. The shed is very easy to install and most customers seem to have no issues at all putting it together. Of course, the simplicity of installation depends entirely upon the customisation options you select. If you choose the windowless design for example, it will be a lot easier to erect than the standard 3 window design. 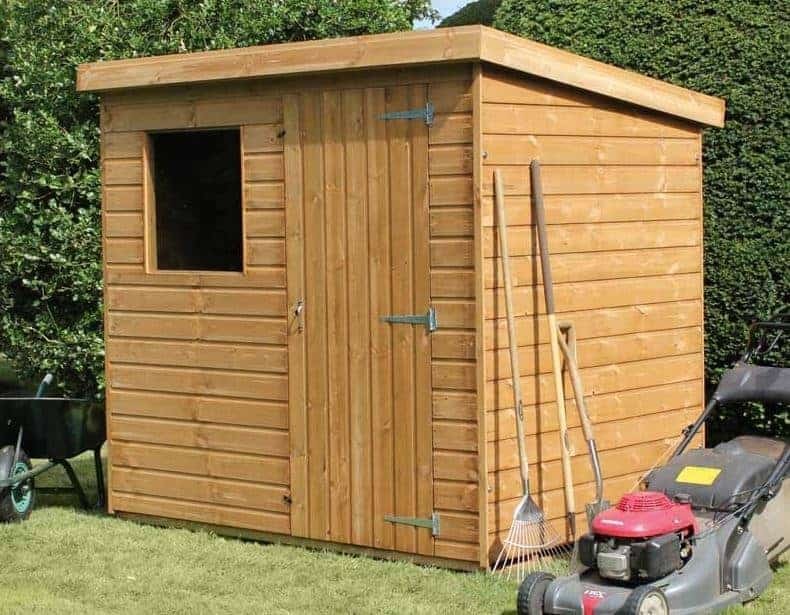 This shed really does give you extraordinary value for money. It benefits from superior quality and the amount of customisation really helps to provide you with a shed that fully fits your needs. Final Thoughts: There are so many things that set the Traditional Standard pent shed apart from its competitors. The fully customisable building can be designed to perfectly suit your needs. It features incredible security and an outstanding quality design. The key operated lock on the single door is one of the highlights of the shed. The fact it comes with tongue and groove cladding throughout is also an excellent benefit. 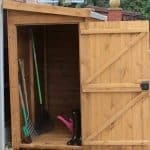 Whilst it isn’t a huge storage shed, it still offers plenty of space to keep your gardening essentials. If you’re searching for a stylish, secure shed that will really last then this is one we definitely recommend.